Zimyo HRMS is a comprehensive human resource management system that combines core functionalities of HR management into a single solution, including time tracking, document management, attendance management, leave management, and roster management to name a few. It is also a part of the Zimyo suite, integrating with other Zimyo solutions such as the Payroll and Recruitment Management products. Zimyo HRMS is specifically created to help start-ups, small businesses, and medium enterprise manage and secure all their HR activities and processes. It is loaded with a plethora of features yet provides users with a scalable platform that allows them to customize the software based on the existing requirements and modify it as their needs change. Zimyo HRMS provides you with a user-friendly solution that lets you monitor your employees and inform you of their latest status, tasks, and hours worked among others through accurate and clear real-time reports. This functionality makes it easy for you to identify employees who are performing well, slacking, and struggling, helping you separate your star employees from those who require further motivation and guidance. Real-Time Tracking empowers your employees to be punctual, efficient, and productive while it helps you build a clear picture of your workforce as well as eliminate discrepancies and anomalies in time logs and attendance sheets. Zimyo HRMS enables you to centralize all your employees’ leave information, from leave requests submitted to dates of their leaves and expected date of return to work. The software makes it easy for you to craft a custom leave approval workflow and notifications. For your employees, they are provided with an online portal where they can file their leave requests and manage their leaves. They don’t have to chase their superiors for submission and approval. Just one click and their leave requests are automatically delivered to parties in charge for consideration and decision. Zimyo HRMS gives you all the tools you need to manage your employees’ schedule. In a few clicks, you can easily create shifts based on your available employees, leave schedules, and absent workers among other things. You can make quick adjustments to your shifts if need be and all workers will be instantly notified of the changes. 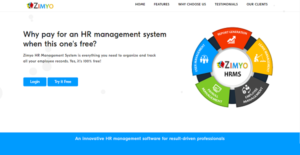 What Problems Will Zimyo HRMS Solve? Manage employees’ personal & professional information at a central repository for quick access and monitoring. Track and manage your company’s assets at the time of employee hiring, promotion or resignation. Keep a central record of all your assets. Track information related to their joining, confirmation, promotion, transfer and resignation. See their whole journey at one click. If you are interested in Zimyo HRMS it may also be beneficial to check out other subcategories of Best HR Software collected in our base of B2B software reviews. There are trendy and widely used systems in each software category. But are they essentially the best fit for your organization’s unique wants? A popular software solution may have thousands of users, but does it offer what you require? For this reason, do not blindly invest in popular systems. Read at least a few Zimyo HRMS reviews and think about the factors that you want in the software such as the cost, main tools, available integrations etc. Then, select a few systems that fit your wants. Check out the free trials of these products, read online reviews, get explanations from the maker, and do your homework meticulously. This profound research is sure to assist you find the most excellent software application for your firm’s unique needs. How Much Does Zimyo HRMS Cost? We realize that when you make a decision to buy HR Software it’s important not only to see how experts evaluate it in their reviews, but also to find out if the real people and companies that buy it are actually satisfied with the product. That’s why we’ve created our behavior-based Customer Satisfaction Algorithm™ that gathers customer reviews, comments and Zimyo HRMS reviews across a wide range of social media sites. The data is then presented in an easy to digest form showing how many people had positive and negative experience with Zimyo HRMS. With that information at hand you should be equipped to make an informed buying decision that you won’t regret. What are Zimyo HRMS pricing details? What integrations are available for Zimyo HRMS? If you need more information about Zimyo HRMS or you simply have a question let us know what you need and we’ll forward your request directly to the vendor.